Where to buy US iTunes Gift Card Online? You are here: Home › Apple › Where to buy US iTunes Gift Card Online? Are you looking for US itunes card? ITunesGC.com is an online store that provides you facility to purchase the certificate of the US iTunes gift, no matter where you are. By using their gift cards from international countries, you will be able to buy anything that you want from the US iTunes store such as latest songs, movies, iPhone apps, iPad apps, books and games that you cannot buy from the itunes store of other countries. You can make payment with your debit card or credit card using the paypal checkout. As the payments are made with the paypal so you will not need to worry about security issues because all transactions will be processed with 100 percent security and safety. When the Company will receive your payment through paypal method, they will send you iTunes gift card code in your paypal email address. You will receive mail from iTunesGC in one hour during their business hours. In case, you have made the payment outside their business hours then they will send you voucher code of your iTunes gift certificate. You will get email within 24 hours so, be patient. Why to buy US iTunes gift card online from iTunesGC? It is the most leading Company that is satisfying its customers throughout the world for more than two years. All gift cards available on their website are sold on retail price as they all are retail cards. They are directly sold from the US retail store such as Apple Stores, Target, Best Buy, Walmart and many others. Also they are trustworthy and 100 percent authentic. 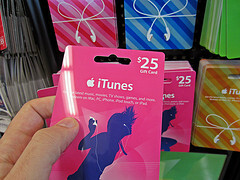 The Company offers iTunes Gift card which have no expiry date. With instant online you will get gift card with the best quality scan in your email on verification of payment. It does not matter what type of card you have for payment because they can accept all international debit cards, credit cards and paypal payment. Buy US iTunes card online now and enjoy. What if you are not from USA? If you think that you are not citizen of USA and probably you cannot use the code of US iTunes Gift Card then you are wrong. Good news for you! You can use this code even if you do not live in USA. What you will need to do is simply open your US iTunes account. If you already have then click on “redeem” and then write the Gift card code in order to credit your account. For those who do not have their US iTunes account, they can register with the US iTunes account by using the code without US credit card. If you have any confusion regarding how to create your account then you can see the guidelines on website for getting detailed instructions. You have various options for US iTunes gift certificate that you can get from here. These are available in different prices including $100, $50, $25, $15, $10. You can change your iTunes store location. Run the iTunes program and then choose iTunes store. Next Entry: Future Phones – What Does The Mobile World Have in Store? Next Entry Future Phones – What Does The Mobile World Have in Store?